Sunday, 11 June, saw the gathering of piano lovers from all over the island. 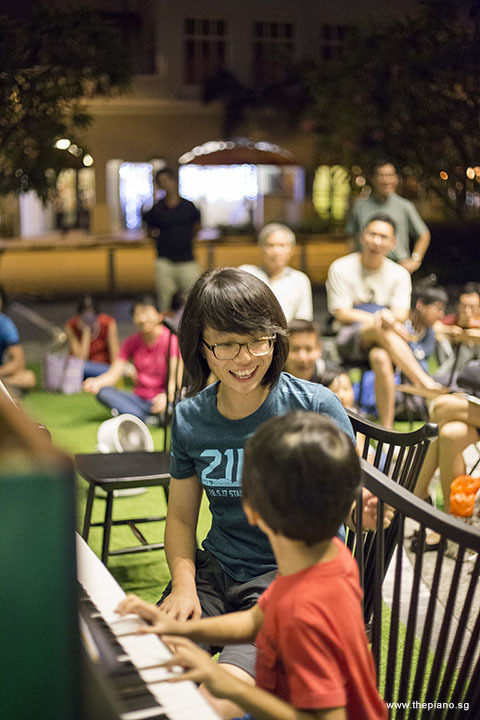 Yet another evening of entertainment and joy, this gathering brought together people passionate about the piano at a common location, The URA Centre on Maxwell Road. 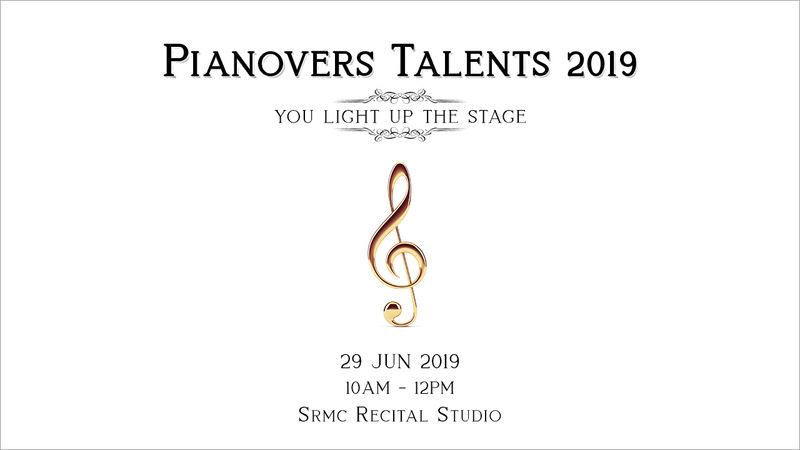 Every Sunday, Pianovers who hail from different backgrounds converge here to perform, to connect and to bond. It is their common love for piano music that makes them return week after week, some with families in tow. This evening’s session was the 39th, since Pianovers Meetups inaugurated in July 2016. Although the Meetups start at 6:30pm, some Pianovers arrive earlier to bond over dinner at Maxwell Road Food Centre. This evening, the dinner party comprised ThePiano.SG’s Founder Sng Yong Meng, along with Zhi Yuan, Jennice, Adelyn, Elyn and Chris. An hour after that, it was back to The URA Centre, where two upright pianos were waiting for them. 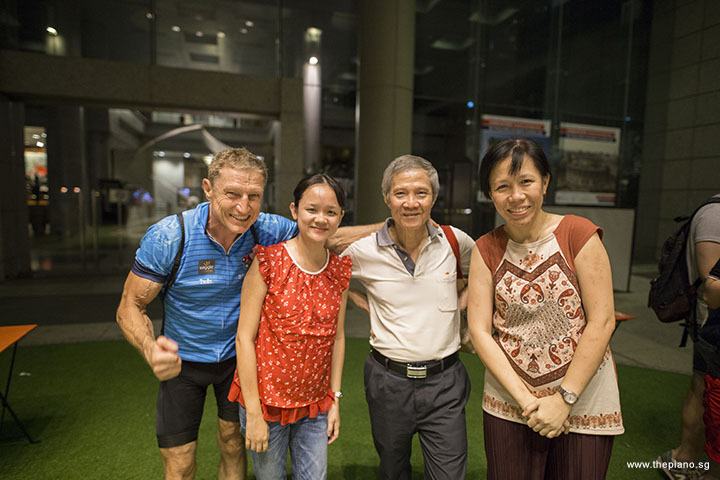 By now, a larger group had gathered, including regulars like Siew Tin and Chris, but also comprising new members Tan Yong Xuan, Kaylene and Dean. It is always heartening to see newcomers joining the Pianovers community. We also had returning Pianovers like Douglas. 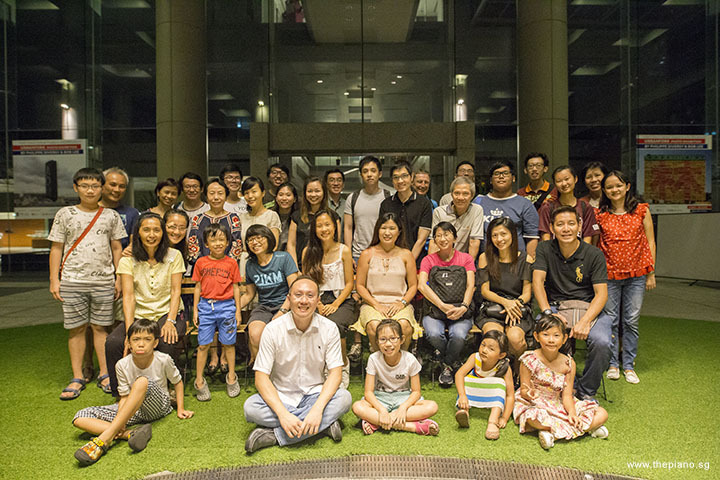 Owing to the school holiday period, this Meetup saw a number of children, many of whom were students of three piano teachers. The young ones were brought by their teachers to perform and to gain exposure in public performances. The evening got rolling with the first segment, the Mini-Recital. 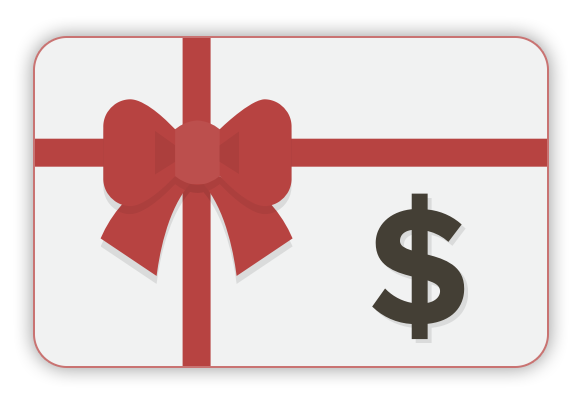 This is a time when pianists pre-register their slots and perform to an attentive audience. 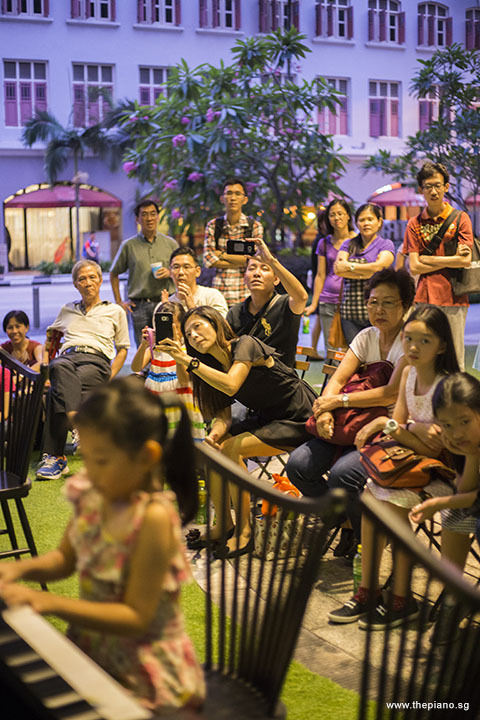 Through the Mini-Recital, ThePiano.SG brings to ordinary folks a stage on which to showcase their talents. Although the environs are simple, this is nevertheless a platform which allows the man on the street an opportunity to perform before an audience. Starting the Mini-Recital was Wen Jun, who performed Cygnus Garden from the popular Maple Story game. This piece was composed by Joe Hisaishi, a Japanese composer and musical director known for over 100 film scores and solo albums dating back to 1981. Newcomer Tan Yong Xuan continued with Habanera (from Carmen), which is one of the most famous arias from Georges Bizet's 1875 opera Carmen. Habanera was used in Act 1 when Carmen danced in front of a group of soldiers that Don José was part of. 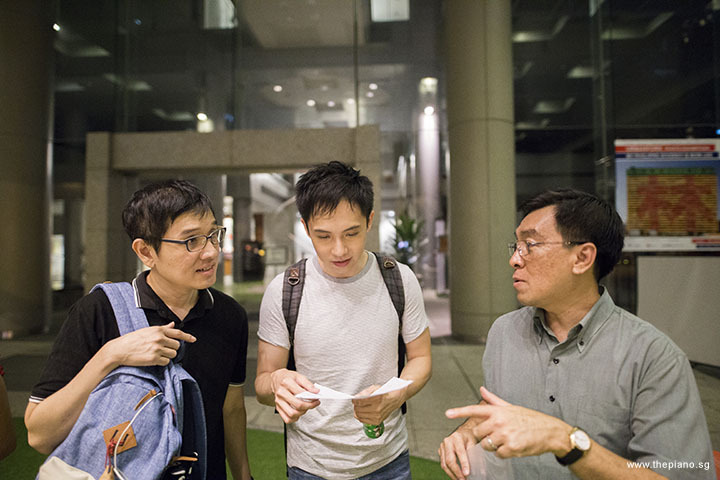 Chinese classics lover Siew Tin brought back a 1992 melancholic piece 英雄泪 written by 许冠杰, and performed by 王杰 (Dave Wong). 王杰 is a Taiwanese-Hong Kong singer and songwriter whose popular hits include "一场游戏一场梦" (A Game A Dream) and "是否我真的一无所有" (Do I Really Have Nothing?). Another newcomer Kaylene delivered two numbers Clowns by Dmitry Borisovich Kabalevsky, and German Dance in B flat by Beethoven. Both pieces are included in the 2017 - 2018 ABRSM Grade 3 Exam Syllabus. It was a treat for everyone as Albert performed two traditional folk songs "蒙古牧歌" and "Doraji Taryeong (Balloon Flower)". The latter is a Korean folk song which originated from Eunyul in Hwanghae Province, and is also a well-known song in Japan, known as Toraji (トラジ). Douglas, who had joined us in previously Meetups, entertained us with Cheek to Cheek by Irving Berlin, which was not only used in the 1935 movie "Top Hat", but also inducted into the Grammy Hall of Fame in 2000. 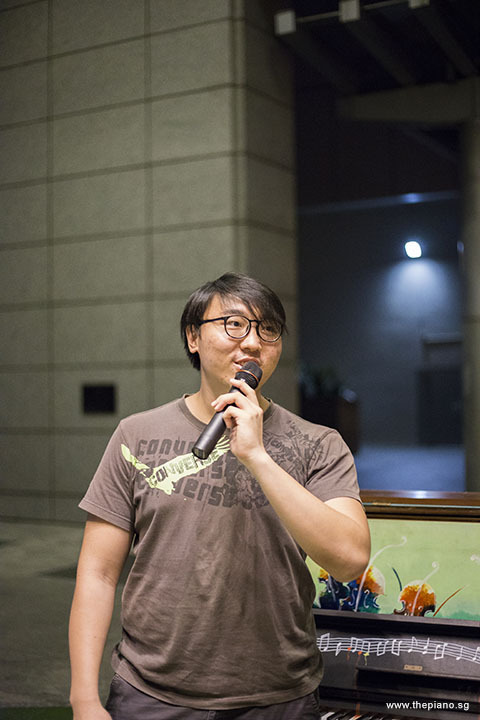 After Chopin's Preludes in the last few performances, Zhi Yuan surprised us with Sonata No. 12 in A flat major (Funeral March), Theme, and Variation 1 and 3 by Beethoven today. He even shared with us the change in the characteristics and styles of the composer's works through the years, and that Funeral March is a Sonata where none of its movements has a sonata form. In addition, he compared it with Mozart's "Sonata No. 11 in A" with a similar structure: a theme with six variations, a minuet and trio, and a Rondo. In what seemed like a continuation of Darth Vader’s and Luke’s light sabre duel – it was actually father-and-son team comprising Ian and Asher – performing Theme from Star Wars, this session saw a mother-and-son duet. 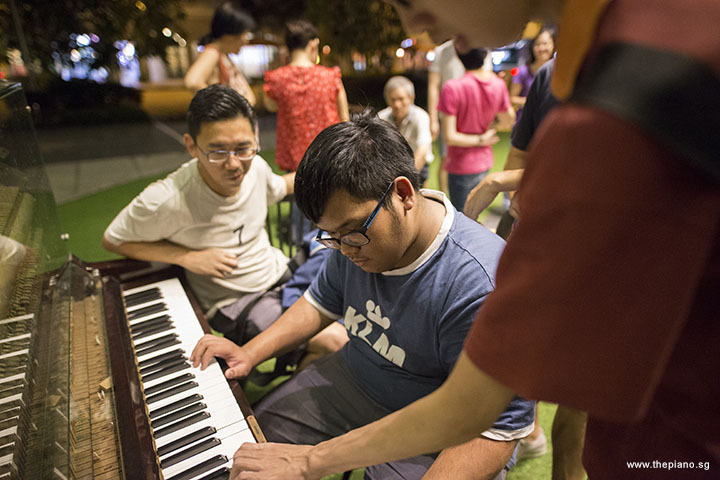 Yu Heng and his mother, Karen, joined hands to a Lullaby. It's always such a joy to see the child playing together with the parent. Shelby, who first joined us in Meetup #14, returned today with his teacher by his side, and performed at one go Lu La Lay, Red Indian Dance, and Merrily We Row Along! Siblings Lucas and Lauren, although new to our Meetup, were more than ready to present us with two pieces each: Waltz in G by Bedrich Smetana, Gospel Flair by Manfred Schmitz, German Dance in B flat by Beethoven, and Attitude! by Nicholas Scott-Burt. Next, Linnette captivated us with Shui Cao Wu (The Dance of Watergrass): 3rd movt from The Mermaid Suite and Carousel, from the 2015 - 2016 ABRSM Grade 7 Exam Syllabus. She is also preparing for her upcoming piano exams in July, together with many of the junior Pianovers here today. 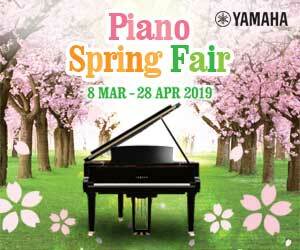 At ThePiano.SG, we wish all students all the very best in the upcoming piano exams! May you shine in your musical journey! It was delightedly fun as Chris played Sing, which is a 1971 song written by Joe Raposo for the Sesame Street, and made popular by the Carpenters in 1973. Newcomer Dean concluded the Mini-Recital with Sonata No. 13 in A major, D664, Allegro moderato by Franz Schubert in 1819. This composition was dedicated to Josephine von Koller of Steyr in Upper Austria, and it is also Schubert's shortest sonata. A total of 22 pieces were performed in this evening’s Mini-Recital, making it a long but memorable one. Thereafter, Pianovers heralded the start of the Open Segment. Each week, during this time, the Pianovers play freely on the two pianos in no pre-set order. 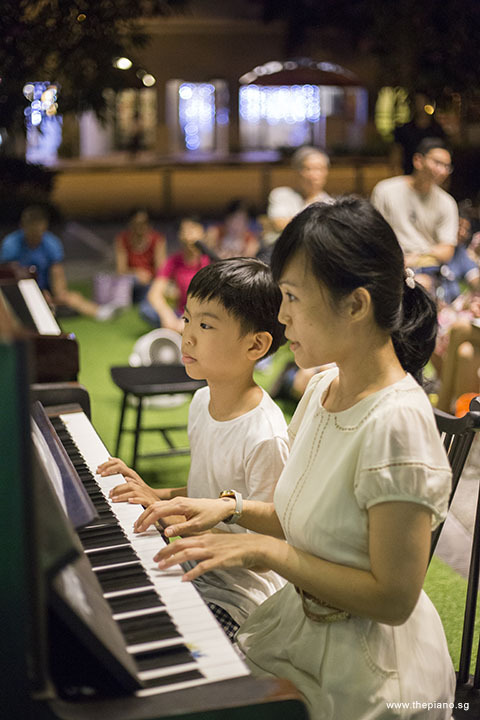 As the performers play, fellow Pianovers are free to interact with them. Other Pianovers also take the opportunity to discuss music, compare notes and to network. Before the group left for the night, Pianovers took a group photograph. It is always good to retain photographic memories of a great evening! Sadly, another Pianovers Meetup had come to an end. Pianovers who had been present had no doubt enjoyed themselves. It was not just the music but also the bonding and friendship that mattered. Let’s all look forward to the next Sunday’s Meetup!